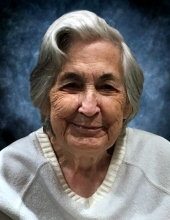 Clara (Bates) Tyce, 83, of Midland, passed away Wednesday, October 24, 2018. She was preceded in death by her parents, Cecil and Tennie (Rushing) Bates; her husband, Albert Tyce; and three sisters, Dorothy Berger, Lucille Yance, and Helen Branch. Clara is survived by her daughter, Reba (Jerry) Owens; four grandchildren, Marisa (Nick Bank) Owens, Jenna (Conner Hogue) Owens, Christina Owens, and Angela Owens; one great grandson Liam Bank; two sisters, Rosa (David) Berger, Faylene (James) Marvin, and one brother, Cecil (Debra) Bates Jr.
Funeral service will take place at 11 a.m. Tuesday, October 30, 2018 from the Ware-Smith-Woolever Funeral Chapel, 1200 West Wheeler Street. Pastor John Pohanka will officiate with burial to follow in Poseyville Cemetery. Her family will receive guests at the funeral home on Tuesday from 10 a.m. until the time of service. Those planning an expression of sympathy are asked to consider a charity of their choice in Clara’s memory. To plant a tree in memory of Clara (Bates) Tyce, please visit our Tribute Store. "Email Address" would like to share the life celebration of Clara (Bates) Tyce. Click on the "link" to go to share a favorite memory or leave a condolence message for the family.